Nature Imagery was started in 1999 by Jeff Anderson, a lifelong naturalist, underwater, nature, and travel photographer. Nature Imagery's mission is demonstrating and communicating our responsibility to respect and preserve the environment. Through direct government contracts as well as working for contracting agencies and cooperative institutes, Mr. Anderson has contributed greatly to state and federal agencies' coral reef ecosystem and oceanic research projects. Through federal contract, Nature Imagery fulfilled in situ and photographic data collection and management services for long-term monitoring of vessel grounding restoration sites in the Florida Keys National Marine Sanctuary (FKNMS). To fulfill those contract requirements, Mr. Anderson planned and conducted benthic surveys collecting demographic data for hard and soft corals, along with underwater still photo and video image capture, assessed injuries and implemented restorative actions to coral reef and seagrass benthic communities caused by vessel grounding, anchor dragging, etc. 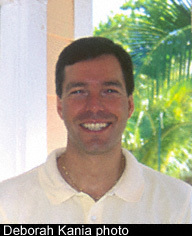 As necessary for potential NRDA cases, Mr. Anderson co-authored scientific reports, journal articles, and presentations discussing the injury assessment, coral restoration, and ongoing monitoring of select sites within FKNMS, including an oral and 2 poster presentations accepted for the 11th International Coral Reef Symposium. Additional requirements of those contracts involved programming, maintaining, deploying, and managing data from 35 water temperature recording stations throughout FKNMS, and making that data available to NOAA and EPA databases for further dissemination. Most recently, Mr. Anderson has been employed by the Research Corporation of the University of Hawaii (RCUH) as a contractor to the Joint Institute of Marine and Atmospheric Research (JIMAR) to fulfill coral reef ecosystem monitoring and research in the US Pacific Territories and Affiliated States. In this role, Mr. Anderson is an important member of the team responsible for conducting autonomous underwater vehicle (AUV) operations conducting surveys up to depths of 1,500 m. In that capacity, Mr. Anderson is responsible for maintaining, mission planning, programming, and operating SeaBED-class AUVs, as well as providing technical input about further system upgrades. Mr. Anderson also conducts stationary and towed SCUBA diving surveys to provide spatially comprehensive, high-resolution demographic data for coral reef ecosystem benthic assemblages, including (but not limited to) size structure, density, condition (i.e. disease or bleaching), recruitment, and how they spatially relate to each other. Mr. Anderson is also currently managing a project involving analysis of nearly 10 years of archived seafloor images. He has been critical member of a multidisciplinary team defining file and data management requirements, classification definitions and procedures development and documentation, and oversight of 14 analysts. Prior to founding Nature Imagery, Mr. Anderson had over 10 years experience in professional, corporate telecommunications environments holding a variety of customer-interfacing and software design positions. His professional marketing responsibilities included developing and implementing comprehensive marketing programs, as well as developing and conducting customer presentations, seminars, and product demonstrations. Mr. Anderson received a Bachelor's of Science and Engineering – Electrical Engineering degree from the University of Michigan. Mr. Anderson has been a NOAA-certified Scientific Diver for 11 years, NOAA Working Diver for 3 years, and PADI Master SCUBA Diver Trainer for 14 years. His advanced instructional credentials include Underwater Naturalist, Nitrox Diver, Underwater Photography, and Underwater Videography to name a few. Mr. Anderson has participated on 11 oceanic research cruises and remote deployments, and has planned and conducted countless shore-based activities operating 20-30 ft. outboard vessels along the southeastern and western US coasts, Caribbean and tropical Pacific regions. Mr. Anderson has accumulated over 14 story and photography publication credits in Alert Diver magazine, including the April 2001 cover photo, exclusive contributor for the "Creature Feature" column for all 2005 issues, as well as four feature stories. He has co-authored 9 scientific reports, journal articles, and presentations. Through experience gained in the diverse fields of marine ecosystem research, freelance photography, and telecommunications Nature Imagery, with its principal Jeff Anderson, can merge technology, SeaBED-class AUV operation, photography, GIS, SCUBA diving, field operations, and marketing expertise to meet the your biological survey and communications needs. Mr. Anderson's images shown on these pages, as well as others in his stock portfolio not highlighted here, are available as photographic prints, for use in editorial publications, or commercial advertising. Mr. Anderson is also available for individual or production crew assignments as either a still photographer or videographer. Please contact Jeff to learn more.